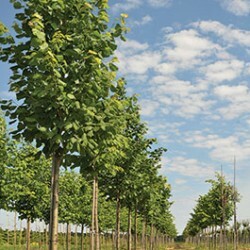 Protecting Trees from Wind | High Caliper Growing Inc.
Strong winds are a challenge for tree farmers across North America. From tropical storms in the Gulf to Pacific gales in the Northwest, wind damage poses a serious threat to valuable inventory. 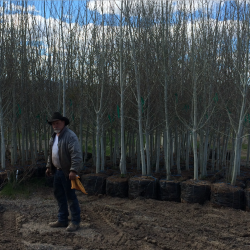 Most farmers have a plan for protecting trees from wind — and it comes with a steep price tag. Thanks to traditional cable support systems, protecting trees from wind is a labor-intensive process. Typically, trees are fastened to a cable with wire, using a hose or sleeve to protect the cambium. In a storm, the wire must be snipped or untwisted to lay the tree down. When the storm passes, workers take to the field, replacing or re-attaching twisted wires as they stand the trees back up. On a tree farm of any appreciable size, the labor costs can be astronomical. 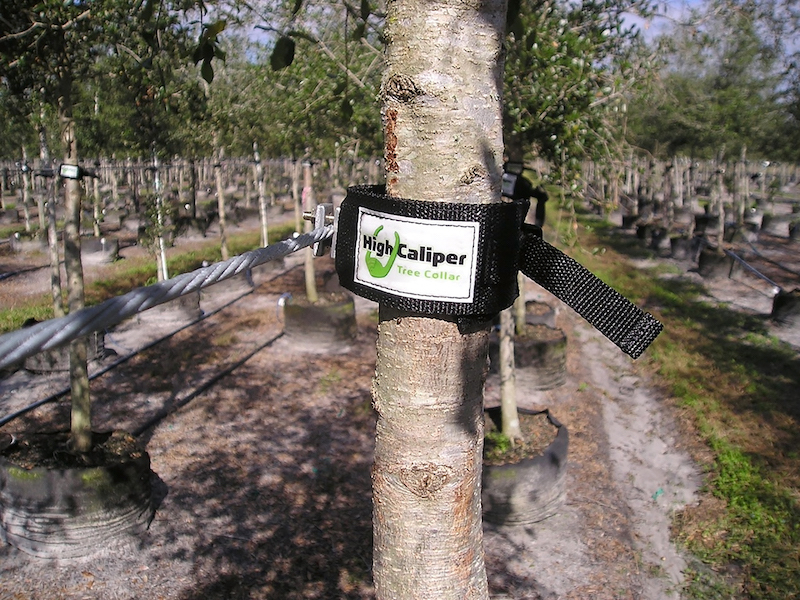 Patented Tree Collars from High Caliper Growing are a game changer for tree farmers. Constructed from heavy-duty polypropylene webbing, they attach to a guy wire or cable in seconds. Once they’re attached to the cable, farmers can secure trees using a Velcro collar and redundant latch. The dual latch system provides stable support that’s easy to adjust, open and close. At several dollars per unit, Tree Collars provide an economical solution for protecting trees from wind. Each collar is extremely durable, lasting anywhere from six to 12 years. Rubber padding inside the Tree Collar protects the cambium from scarring. 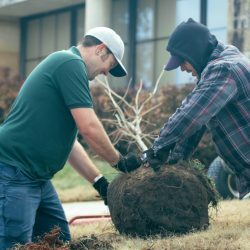 That’s a major advantage because scarring can reduce a tree’s value by half, turning a $400 tree into a $200 tree in minutes. When it comes to preserving value and saving labor, Tree Collars pay for themselves over and over again. Two simple tips can help you maximize the value of your tree collars. First, leave approximately 1/4” to 1/8” between the collar and the tree. This allows the tree to sway in in the wind ever-so-slightly, which thickens the trunk and improves the caliper of the specimen. Next, perform regular maintenance — just like you would on any other piece of equipment. When you’re out checking drip lines, make a point of checking your tree collars. Ensure they aren’t too loose or tight, and make adjustments where necessary. Periodic maintenance will prolong the life of your collars and keep your trees in tip-top shape. For pricing, installation instructions and testimonials from satisfied customers, visit our product page. Whether you’re a broker, established operator or brand new to the business, Tree Collars have something for everyone. Give them a try today and see why they’re taking the industry by storm!